Manko, Gold, Katcher & Fox attorneys Marc Gold, Todd Kantorczyk and MGKF’s in-house technical consultant, Darryl Borrelli, present, “Getting the Deal Done: Buying and Selling Contaminated Property.” The seminar will take place on September 18, from noon to 1 p.m., at the Holiday Inn, 100 Pine Street in Williamsport, PA. 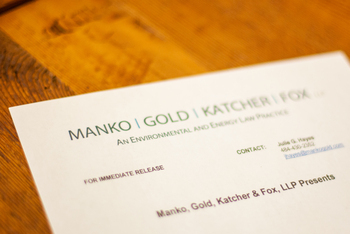 The course has been approved for one CLE credit (environmental law). The program is sponsored by the Lycoming Law Association (LLA). For program details and to register, visit www.lycolaw.org.